I finally finished Evelyn's room! And it's now one of my favorite places to be. It started out like this: green walls, random furniture which you can see I could never make up my mind on what to put where. I got that wicker dresser for free and painted the drawers back in the Spring. It's a narrow room which is the perfect size for a nursery, but it also felt way too crowded. I had a goal to finish it before her 1st birthday. Not that she could care less, but I did. I wasn't sure what direction to take with it all until one day I found this piece of scrapbook paper in my stash and that became my inspiration. I painted the walls, moved the wicker dresser into the closet and replaced it with this yellow desk I got for free and painted a few years ago. Besides the rug (which I scored at Ross for $20! ), everything else I already had sitting around the house. I didn't want to spend much money on it. Someday, I'd like to switch out the light fixture. ^those eyes melt my heart. Ahhh!! I LOVE it! I was just going to ask you when the big reveal was. 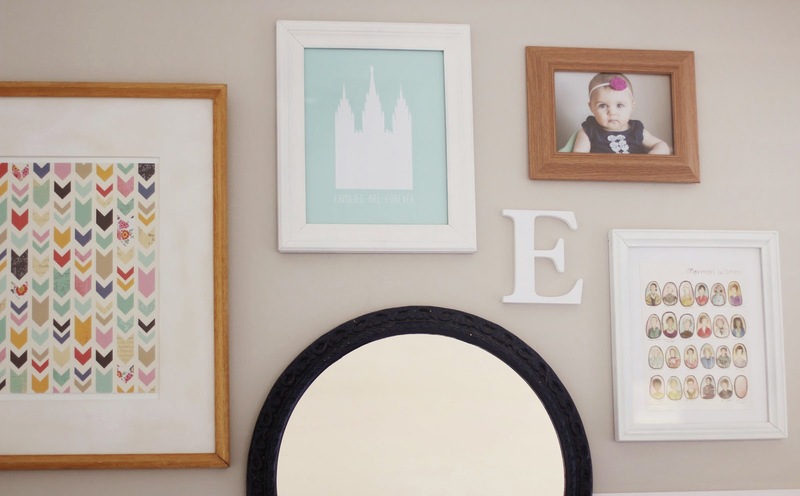 It's the perfect room for one perfectly adorable little girl!! Such a cute room! I love it! And Evelyn does have the most beautiful eyes! Just like her momma!! !